Katharine Drexel was born to a well-known Philadelphia family in 1858. Her mother died just a few weeks after her birth, but her father remarried, and she and her sisters were raised in a family of deep faith. Katharine was taught from a young age to share what they had with others in need. As she grew, so did her love for God and others. She focused her energy on the material and spiritual well-being of blacks and Native Americans, whose plight she became aware of on a trip out West. She began by donating money, but she could see that more needed to be done. 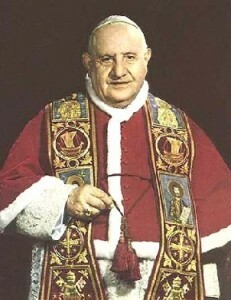 During an audience with Pope Leo XIII in Rome, Katharine asked him to send missionary priests to the United States to minister to Native Americans. The pope asked her why she did not become a missionary herself. 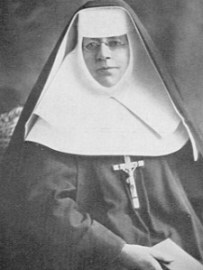 So Katharine founded the Sisters of the Blessed Sacrament for Indians and Colored People in 1891. She and the Sisters worked to improve the lives of those they served. From age 33 until her death in 1955, Katharine dedicated her life and a fortune of twenty million dollars to this work. In 1894, Katharine opened the first mission school for Indians in Santa Fe, New Mexico. Quickly, more schools followed, serving both Indians and blacks. Schools to train teachers were also created, and she founded Xavier University in New Orleans, the first black Catholic college in the United States. By the time of her death, more than 500 Sisters were teaching in 63 schools throughout the country. Katharine was canonized by Pope John Paul II on October 1, 2000. 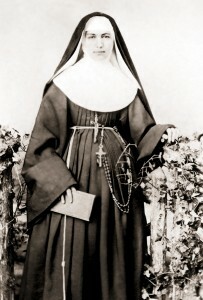 She was the second American-born person to be named a saint.